Heat oven to 350°F. Sprinkle both sides of each pork chop evenly with cumin, salt and pepper. In 12-inch ovenproof skillet, heat oil over medium-high heat until hot. Cook onion in oil 6 to 8 minutes or until softened and light golden brown. Remove from skillet. In same skillet, place pork chops; cook 5 to 6 minutes, turning once, until light golden brown. Place skillet in oven; bake 8 to 12 minutes or until pork is no longer pink and meat thermometer inserted in center reads 145°F. In small bowl, mix Sauce ingredients. Carefully (handle will be hot), add Sauce and onions to skillet; bake about 5 minutes longer or until slightly thickened. *Pork chops vary in size or thickness, depending on the bone weight. Want something different from onions? Use shallots! 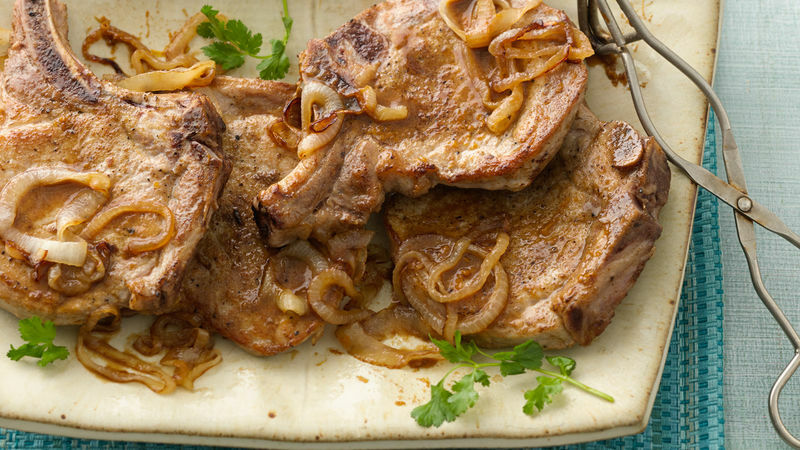 These pork chops are topped with caramelized onions and a wonderful orange glaze.